The Supreme Court on Monday stayed an interim order passed by the Justice C.S. Karnan of the Madras High Court in a suo motu writ proceeding staying the administrative order of the Chief Justice of the Madras High Court with regard to selection of civil judges in the lower judiciary of the state of Tamil Nadu. Justice Karnan had stayed the selection proceeding after he raised objections against a five-member judge panel interviewing candidates for selection as civil judges. He accused one of the judges with having a fake degree certificate and questioned the inclusion of two judges from the same community and family. He sought that two of the judges be from minority communities, Muslim and Christian. The controversy started with the Chief Justice Sanjay Kaul constituting the recruitment committee comprising of Justices V Dhanapalan, R Sudhakar, D Hariparanthaman, N Kirubakaran and R Mala to interview candidates for selection as civil judges. The Tamil Nadu Public Service Commission chairman and other officers were to be part of the selection committee and it was scheduled to start oral interview of candidates form April 15 till April 21. On April 16, Justice Karnan initiated suo motu proceedings and passed a judicial order questioning Justice Dhanapalan's inclusion in the committee. He alleged that latter had produced "bogus educational qualifications" about his bachelor and masters degree in law, he had no locus-standi to conduct interview. He also alleged that inclusion of Justices Sudhakar and Hariparanthaman, who hailed from the same community besides being relatives, would send a wrong signal about the fairness of selection. He went on to stay the CJ's administrative order and restrained the public service commission chairman from conducting the interview of candidates for civil judge posts. "In order to control the mal-administration of My Lord Chief Justice, I am passing this suo-motu judicial order in the interest of justice invoking Article 226 of the Constitution to restore the confidence in the Madras high court and confidence with the general public," he said and ordered that two judges must be from minorities communities - one from Muslim community and another from Christian community - to give a fair representation to all communities in the recruitment committee. On April 17, Justice Karnana's suo motu order was placed before a division bench of Justices S Tamilvanan and C T Selvam, which stayed the April 16 order. "This court requests My Lord the Chief Justice to extend his cooperation without any interference with my court's proceedings and its judicial power in order to maintain decorum of the court and avoid an unhealthy practice of judiciary in the interest of the general public. My deep request to the Chief Justice is to avoid ego and stop acting in an autocratic manner to protect democracy," Justice Karnan said in his order. 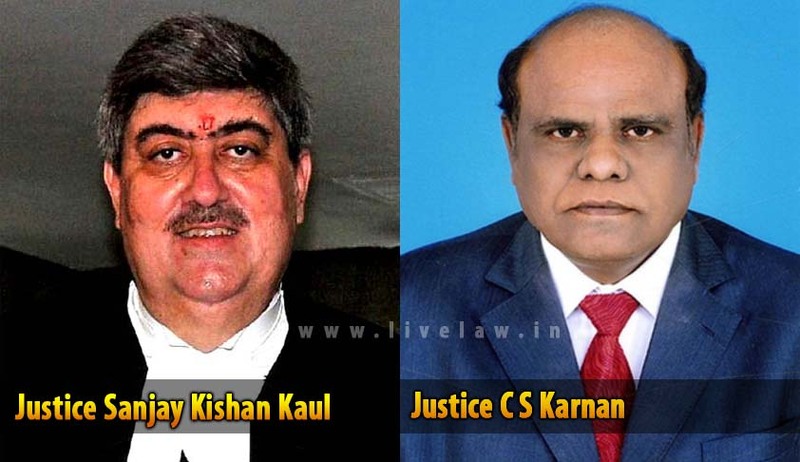 Ordering status quo on interviews to be conducted by the public service commission, Justice Karnan said: "My deep request to the Chief Justice is that you should not interfere in my judicial process in the instant case, failing which, this court will initiate contempt of court proceedings against you and also give direction to the chairman, National SC/ST Commission to initiate proceedings to conduct a detailed enquiry regarding your harassment of me being a dalit judge to make you perforce to book you under the SC/ST atrocities Act." The Madras High Court then registry moved the Supreme Court seeking stay of the order passed by Justice Karnan. Senior advocate K.K. Venugopal, appearing for the High Court registry, said that “the conduct of this judge has brought great disrepute to the High Court by his so-called suo motu judicial order.” He also said that Justice Karnan’s order has brought disrepute to the institution and hence all judicial works should also be withdrawn from him. The CJI-led Bench however, said that this aspect could be decided on the administrative side, in accordance with the in-house procedure evolved by the higher judiciary. The bench then stayed the impugned orders passed by Justice Karnan. “There will be a stay of the interim order dated April 30, 2015, passed in a suo motu writ petition,” a bench headed by Chief Justice H.L. Dattu said on Justice Karnan’s order in a case relating to appointment of officers of lower judiciary. “We restrain the judge who initiated the suo-motu proceedings relating to the suo motu writ petition pending before Madras High Court from either hearing or issuing any direction in the said writ petition,” the bench also comprising of Justices Arun Misra and Amitabha Roy said. It further said that in all other matters connected with it, there shall not be any interference by any person or authority or judges in completing the process initiated by the High Court for selection and appointment of junior judicial officers in Tamil Nadu till disposal of the special leave petition. The apex court bench, headed by Chief Justice H.L. Dattu, also stayed the interim order by which Justice Karnan had sought to initiate contempt proceedings against Madras High Court Chief Justice Sanjay Kishan Kaul for allegedly interfering with his judicial order by passing orders on the administrative side. The bench posted the appeal filed by the Madras High Court registry against the order passed by Justice Karnan for hearing after the vacation. This is not the first time that Justice Karnan has landed himself in a controversy. In November 2011, he had stirred up a controversy by alleging that fellow judges had humiliated him. He said Dalit judges were targeted and their reputation tarnished whenever they asserted their self—respect. In 2013, he had passed a ruling which had said that if a couple in the right legal age indulge in sexual gratification, it will be considered a valid marriage and they could be termed as husband and wife. In January last year he created another stir when he commented against the high court collegium over the selection of judges. He had entered a court hall, where a division bench was hearing a PIL, questioning the process adopted for selection of 12 judges for the High Court, and said that the process was not fair. The Supreme Court had in March last year came down heavily on Justice Karnan, terming his conduct in this case as “indecorous” and “uncharitable”. On Justice Karnan’s complaints of an upper caste bias in appointment of judges, the Supreme Court had said that he may have “found himself caught in a conflict of class or caste structure and it appears that matured patience might have given way to injure rules of protocol.” The court observed that such conduct may require a more serious judicial assessment in future. The apex court pointed out that immense dignity was expected from the judges, and that weaknesses or personal notions should not be exposed so as to affect judicial proceedings.